Tried and true adventure camera series now waterproof to 40 feet and features new backlit 16 MP sensor, 1080p video and six LED lights for extreme macro photography. 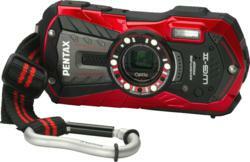 The Pentax WG-2 series adventure cameras are waterproof, crushproof, dustproof, coldproof, and shock-resistant. The new WG-2 series digital cameras can withstand virtually any environmental challenge while maintaining the same resiliency and work ethic as those who use it. PENTAX RICOH IMAGING AMERICAS CORPORATION announces today availability of its new Optio WG-2 and Optio WG-2 GPS digital compact cameras. The new models represent the 13th generation of Optio series cameras, reflecting the timeless legacy of the line. This latest generation of PENTAX adventure cameras are now waterproof up to 40 feet, dustproof, coldproof, crushproof, and shock-resistant. The improved image quality in high-sensitivity shooting situations such as night shooting or in poorly illuminated indoor settings and full 1080p HD movie recording capability add to the cameras’ rugged design and durability. In addition, the new PENTAX WG-2 series cameras feature a new backlit 16 MP sensor and six unique LED lights for extreme macro photography. Later this spring, PENTAX will introduce a SportMount Chest Harness for hands-free handling of the cameras, ideal for sport enthusiasts who like to document their adventures. High-resolution Full HD 1080p movie recording (1920 x 1080 pixels) at 30 FPS with high quality h.264 compression. Waterproof to depths of 40 feet. Digital Microscope mode with one additional macro LED (total of six lights) for excellent macro lighting of subjects as close as 1 cm. A newly designed GPS module that delivers a shorter time lag before GPS start-up and longer battery life during GPS activation. A new optional SportMount Chest Harness that straps-on the WG-2 for hands-free HD movie capture of every exciting moment of adventure on land, sea or in the air. Shockproof design protects camera that are dropped from a distance of up to 5 feet. Crushproof construction withstands weights up to 220 lbf (pound-force). Coldproof to sub-freezing temps of minus 10 degrees C (14 degrees F). Dustproof design protects the camera from dry, dusty environments. Wide angle 5x internal optical zoom lens (28-140mm equivalent). Large 3-inch LCD features HVGA resolution (460,000 dots) and anti-reflective coating on its protective cover. Hardened cover with SP coating protects internal lens elements. Pixel Track, Digital, and Movie Shake Reduction ensure sharp, blur-free images and video. Fast Face Detection technology including Smile Capture and Blink Detection to capture perfect portraits. A Handheld Night Snap mode produces a single blur-free, composite image from four images of the same scene. An autofocus assist lamp helps to quickly and accurately focus. Extended dynamic range helps bring out extra highlight and shadow detail. PENTAX infrared remote control compatibility for remote shooting. GPS and non-GPS versions are available in several new stylish color options. The Pentax WG-2 GPS adventure camera includes a newly-designed GPS module that delivers a shorter time lag before GPS start-up and longer battery life during GPS activation.